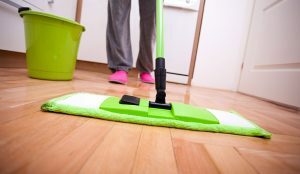 Cleaning includes all services normally associated with a house cleaning company, including emptying all trash, dusting, vacuuming carpet, cleaning mirrors and insides of windows, and cleaning the bathroom toilet, shower/bath, floor, and sink. Cleaning services are available Monday through Friday. Service is provided on a first-come, first-served basis.